Things that have change during the course of my academic life are innumerable but one thing that I have noticed that has been quite drastic is my body clock. I would use their time in school to do the lectures, tutorials, the library trips etc, then when I should have been consolidating my days efforts I would be cooking, cleaning and organising two children for school the next day; meaning that come deadline time I was pulling almost constant one nighters ( which resulted in great marks on the papers and not so great black bags under my eyes). This situation could have ended some time ago as now both my children are teens and you would think that their growing self-sufficiency would equal a growing amount of time for me to indulge my latest research whims work. But alas, no! The manuals do not tell you that children become more demanding of your attention the older they get. They also hold you to account more; they store up missed football matches, school recitals and days out and write them down in the Catalogue of Motherly Guilt, which they will pull out at any opportunity that will see a benefit for them and be torture for you! YUP - Calvin - you and me both! My internal body clock is well and truly FCUk’d these days – I am at my most alert when everyone else seems to be winding down! It got me to thinking! 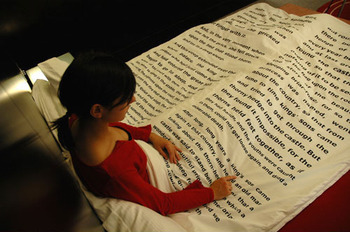 Am I alone in wanting this duvet cover? The other benefit to indulging my reluctance to become alert with the dawn chorus is that I think more effectively. I am in a half dreamlike state, not fully aware of the day and all its complication – it is a liminal space in which thoughts can wander untethered to the mundane or the practical or the word processor! I have found my best ideas have emerged from this ‘slow period’ of the day. Only this morning, as aI was reading ‘Writing For Their Lives The Modernist Women 1910-1940′ the whole purpose of my thesis suddenly became clearer, including why I had chosen to study the texts I had. It is a relatively small breakthrough but it should benefit the coherence of the work enormously. Am I alone in being a real night owl at odds with normal society and it’s 9-5 mentality? Or are we all fighting this urge to curl up until about 10 am when they day really starts? Sounds like you have the perfect plan. I find that the juggle between real life and time to read, study, write etc is a difficult balance and one I will confess to not having quite right yet. Having read your post I realise that I’ve probably been tuning more into the life stuff than to times (even unorthodox) that work for me. Your post got me thinking – I’m going to try to go with the flow a bit more – if it means that I work from bed (something I’ve never really tried) then so be it. It’s worth analysing when you are most productive, when you feel most motivated etc and then trying to work at those times rather than to some socially imposed clock. One thing studying has taught me is to look at things sideways instead of straight on! Your approach totally makes sense, but if I tried to work that way it would all go horribly wrong. Or, more likely, not go anywhere at all. For me, what works is to treat the PhD like a job. I have a share in an office at Uni (and before that my lovely carrel), and I drive to Uni every day as though I were going to the office. There are some days when I do less than others, but at least I take the opportunity to impose some kind of discipline on myself. I also come in at least 5 days a week (usually 6), and I find that I put in serious hours – more than I ever did when I was working for a living. My most profitable thinking time, however, is either in the gym or while driving. I get so much planned that way. Of course, I’m lucky in that I only have myself to look after – I don’t know how I’d be able to cope with this if I had a family to run! I admire your stamina – I tried to follow this routine for about two years and ended up with a body that was completely stressed out and exhausted so I have had to adapt. Maybe it is the extra pressure of raising two kids, I don’t know? I do have a lot of support. But I never managed to be productive at my uni office until it was time to go home! I’m totally with you on this. 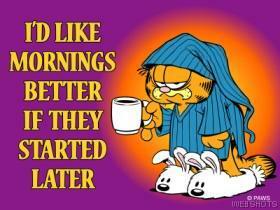 I would much prefer to stay up till about midnight and sleep later in the morning. I sleep better in the morning and am able to concentrate better in the later evening when everything is so quiet. Guess we are out of whack with the rest of the world.